No Wasted Time: Let us do the work for you. We can quickly find reputable soil testing companies in your area. No Uninformed Decisions: You will receive access to soil engineer reviews. Getting Your Soil Tested - How Much Does Soiling Testing Cost? Soil testing performed after digging a foundation will cost on average $300 to $1,000. Soil testing performed before digging begins is much more complicated and therefore expensive. You should budget around $3,000 to $5,000 or more for pre-digging soil analysis. 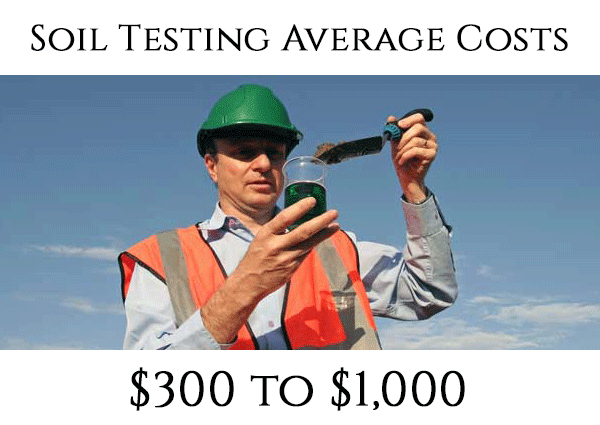 How Much Will Soil Testing Cost? The characteristics and quality of your soil play an important role in how a home or building is constructed. Before any construction can begin, a professional must analyze the soil to determine its suitability for the project. Soil testing services are provided by geotechnical engineers, although these professionals are often referred to colloquially as soil engineers or soil technicians. If you’re planning to build a new home or building, an addition or a basement, plan on hiring a geotechnical engineering firm for soil testing. Why Do I Need My Soil Tested? All of this information is used to make decisions about how your home, building or addition will be constructed. For example, information about soil conditions must be provided to the structural engineer to be used in designing a foundation. The type of foundation built on sandy soil differs from that built on a bed of rocks. Soil testing information can also be used to find the best location for a septic system or well, or to address drainage issues. Most geotechnical engineering firms provide a range of services, including lab testing, soil analysis and technical support. When testing and analysis are complete, the firm can provide a report on soil conditions. These reports can be called soil reports, geological reports or geotechnical reports, among other names. Most soil testing is done immediately after digging the foundation but before the footings are formed. Set aside about a day for the testing to take place, and budget about $300 to $1,000 in most cases for a single-family home. The engineer will probe the soil, examine it and give you an immediate opinion. This price does not include a written report or analysis - that will cost extra. Soil can also be tested prior to digging the foundation, but this is a complicated and expensive process. Large machines are required to bore holes into the ground to remove the soil. This type of testing can easily cost $3,000 to $5,000 or more, so the method is rarely used for single-family home construction. If your soil is lacking in quality, a geotechnical engineer can give you advice on how to address the problem. In some cases, the solution is installing wider, thicker and/or deeper footings; in other cases, it’s best to dig out the pockets of bad soil and replace them with engineered fill. Whatever the recommendations, you’ll want to get them in writing to share with the structural engineer and your local building inspector. However, that does come at an added expense. Ask other construction professionals such as structural engineers or local builders for their recommendations. They have plenty of experience working with geotechnical firms, so they should know who’s good. Seek quotes from several local firms to compare prices, but never choose on price alone. Always consider the company’s reputation and experience. Look for an experienced, well-established firm that is willing to provide references. Make sure the references are current. Make sure the company you hire is fully licensed and accredited. Do You Need a Soil Testing Pro Near You?